The Sea Ranch Resort is a laid-back oceanfront hotel that offers comfortable accommodations and modern amenities with breathtaking views. 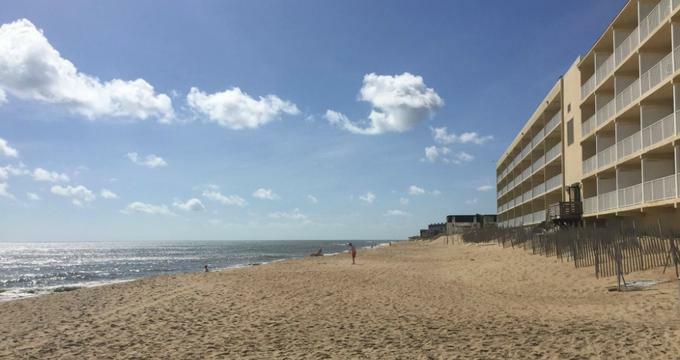 Set in Kill Devil Hills on the Outer Banks of North Carolina, the comfortable hotel features charming guest rooms with mini fridges, microwaves, and pull-out sofas, and luxury two-bedroom condo-style suites have full kitchens, dining areas, and separate living rooms. Some rooms and all suites have private balconies with breathtaking ocean views. Amenities at the Sea Ranch Resort include an indoor swimming pool, a fully equipped exercise room, free yoga and Pilates classes during the summer, a seasonal oceanfront restaurant serving American cuisine, and nightly live entertainment. The Sea Ranch Resort is a short walk from the beach and a few miles from the North Carolina Aquarium, Jockey’s Ridge State Park, and the Wright Brothers National Memorial. The Sea Ranch Resort features a variety of lodging ranging from oceanfront guest rooms to deluxe condo-style suites. Located in the main building of the hotel, well-appointed and recently renovated guest rooms have modern furnishings, king-size or queen-size beds with fresh linens, sleeper sofas for extra guests, and en-suite bathrooms with shower/bath combinations, thick towels, and branded bath products. Modern amenities include air conditioning, flat screen televisions with cable channels, coffee makers, mini-refrigerators, microwaves, telephones with voicemail, hairdryers, irons and ironing boards, and complimentary wireless Internet. All guest rooms have private ocean facing balconies with spectacular views. Deluxe oceanfront condominium-style two-bedroom suites feature two bedrooms with king-size beds in fresh linens, en-suite bathrooms with shower/bath combinations, thick towels, and branded bath products, and fully equipped kitchens with full-sized refrigerators, oven/ranges, dishwashers and washer/dryers. Breakfast bars connect open plan kitchens and dining areas with table and chairs for six people, and separate living areas have comfortable sofas, including sleeper sofas for additional guests, and open on to private, ocean-facing balconies with spectacular views. The Beachside Bistro at the Sea Ranch Resort serves a creative menu focusing on American Coastal Cuisine for breakfast, lunch, and dinner against a backdrop of ocean views. Brunch is served on Sundays, and live entertainment is offered from Thursday to Saturday. Deluxe amenities at the Sea Ranch Resort include an indoor swimming pool, a fully equipped exercise room, free yoga and Pilates classes during the summer, a seasonal oceanfront restaurant serving American cuisine, and nightly live entertainment. Kill Devil Hills offers a variety of things to see and do, along with cultural and outdoor recreational activities. The town's beautiful beaches are ideal for surfing, kayaking, angling and beach combing, while there is mountain biking, mini-golf, go-carting, and playgrounds for the whole family to enjoy. A 10-cinema movie-plex offer nighttime entertainment, and other forms of fun include laser tag, tie-dying and pottery painting. The Sea Ranch Resort caters for destination and oceanfront weddings, offering luxury accommodations, modern amenities, and spectacular views. Boasting an idyllic beach ambiance with white sands, blue seas and elegant, nautical themes, the resort lends itself to romantic island-style weddings, beach ceremonies, and elegant receptions. In addition to beautiful venues, the resort also offers exclusive services such as customized menus and outstanding cuisine, preferred vendor lists, professional wait staff, and event planning and management teams to take care of every detail.